-Disposable|Heroes- • View topic - Go All to Piecesâ€”The Mog Tablet Quest Unearthed! Go All to Piecesâ€”The Mog Tablet Quest Unearthed! Post subject: Go All to Piecesâ€”The Mog Tablet Quest Unearthed! Psst, you. Yes, you, kupo! You know the nomad moogles, do you not? Turbans wrapped around their heads, looking like they just came back from a cross-Vana'diel hiking expedition? Well, believe it or not, some say that they're actually the descendants of an ancient, long-lost moogle civilization that holds the key to a fabled treasure, kupo! What's that? Just another tall moogle tale, you say? Sit back, friend, and let me tell you the tale, kupo. 'Tis a tale of countless generations past—of joy, of sadness, and one magnificent moogle monarch's unrealized dream. Our story begins in the ancient kingdom of Kupalika, a peaceful and prosperous nation where ten thousand score of moogles and some twice as many sheep lived together in moogle magic-enhanced harmony. 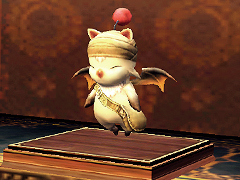 This magnificent moogle monarchy reached the peak of its prosperity during the reign of its seventh ruler, King Kupofried the Great, a peerless paragon of a potentate whose wisdom, benevolence, and mastery of magic have yet to see their equal. Verily, it was the selfsame King Kupofried who developed the teleportation techniques of which you adventurers are so fond, kupo. Yet time and tide wait for no moogle—not even the mighty King Kupofried. Having grown old and gray, and knowing his time was near, the sagacious sovereign set about his life's work—eleven poems of happiness and joy, engraved on tablets of stone, that could be entrusted to future generations to ensure everlasting peace and prosperity for his children, his grandchildren, and all of mooglekind. Sadly, it would soon become evident that the kindly king's tranquil temperament was not shared by his progeny, kupo. No sooner had the petty princes and princesses caught word of the tablets' existence than they embroiled themselves in a bitter brouhaha over which of them would inherit the freshly hewn heirlooms. King Kupofried was devastated, dejected, and demoralized, kupo. How could his verses, born of such heartfelt joy, become the source of such strife among his scions? In a fit of frustration, he commanded his minion bats to scatter the stone tablets to the far corners of the world, that they might never be seen by moogle eyes again. The next day, he vanished from his throne and kingdom, never to return. Bereft of its wise monarch, Kupalika soon spiraled into decay—and eventually, downfall. The myriad moogles who once lived together as one people fractured into numerous tribes, some preferring to live alongside Altana's children, with others opting to preserve their nomadic customs. One of these tribes, smallest in number yet stoutest in spirit, is that of the "explorer moogles," kupo. Tracing their lineage back to King Kupofried himself, these brave souls scour the far ends of Vana'diel in search of the long-lost tablets for generation after generation, that they might someday realize their legendary forefather's abandoned dream. But relics of legend are not so easily found, and the explorers' staunchest efforts seemed doomed to end in vain, kupo. That is, until just the other day, when a particularly intrepid explorer caught word of a tablet sighting. Is this report authentic? If so, where are the tablets to be found? And why have they only now surfaced, after so many years? Most importantly, can any profit be had from this, so as to bring the MHMU out of the red at long last, kupo!? The questions are endless, and there's only one way to answer them. You—yes, you, my adventuring friend!—must lend your strength and substantial sleuthing skills to the explorer moogles' investigation. Who knows? With your help, the mystical powers of our long-lost treasure just might bring peace and prosperity to the land of Vana'diel at its hour of greatest need. So what are you waiting for? Go forth, and may the spirit of King Kupofried watch over you! You heard the good moogle—only you can help recover the legendary treasure of King Kupofried! Assist the explorer moogles in tracking down the eleven lost tablets, then bask in the benefits as their mysterious "Super Kupowers" fill the realm with happiness and joy! Additional rewards also await the astute adventurers who unearth the precious relics. The Mog Tablet Quest will commence on Tuesday, May 12 at 1:00 a.m. (PDT) and continue indefinitely. Super Kupowers will go into effect when all eleven tablets have been found, their magnificent moogle magic affecting nearly all (*see note below) known world areas. These beatific boons will endure for one week before the quest draws to a temporary close. 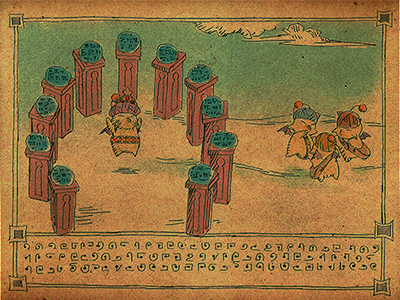 After a set period of time, the tablets will once more be scattered to the winds, and the quest will begin anew! Players may check the current status of the Mog Tablet quest at any time by speaking with the Explorer Moogle stationed in Ru'Lude Gardens (H-9). What's that? You want some advice before you go off gallivanting around the world? Very well, kupo. Word has it that the eleven tablets are concealed in the areas below, with no more than one tablet in any single location. When a tablet is successfully unearthed, a message will be displayed to all adventurers in the aforementioned areas informing them of the discovery. The player who uncovered the tablet can proceed to the Explorer Moogle in Ru'Lude Gardens (H-9) to collect a well-deserved reward! The mystical Super Kupowers of King Kupofried will go into effect once all eleven mog tablets have been recovered, providing an assortment of benefits for all adventurers within the affected areas. Three powers from the list below will be selected at random, and will remain active for one week (Earth time) before the quest starts anew. *During the Adventurer Appreciation Campaign, all eleven bonuses will go into effect at once (see below for details). "Thrifty Transit": Outpost teleport sites will operate free of charge! "Martial Master": As an added Signet effect, battle skills will increase more rapidly! "Blood of the Vampyr": Signets will be boosted with the abilities of Regeneration and Refresh! "Treasure Hound": Signet will grant you the Gilfinder and Treasure Hunter abilities! "Artisan's Advantage": The chances of losing ingredients due to failed synthesis will be significantly lowered! "Mystery Boxes: San d'Oria": Treasure Caskets will appear more frequently around San d'Oria! "Mystery Boxes: Bastok": Treasure Caskets will appear more frequently around Bastok! "Mystery Boxes: Windurst": Treasure Caskets will appear more frequently around Windurst! 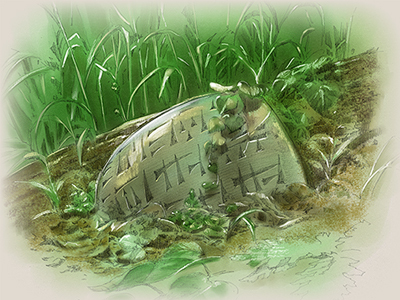 "Mystery Boxes: Frontier Lands": Treasure Caskets will appear more frequently in the north and other distant lands! "Swift Shoes": Adventurers who are fully rested and healed will temporarily be able to run with great speed! "Ease of Exploration": A teleport service connecting the towns of Mhaura and Selbina to the three nations will appear! *Effects will be limited to areas from the original FINAL FANTASY XI and the Rise of the Zilart and Chains of Promathia expansions, with certain areas excluded. *Upon entering an affected area, a message indicating the active Super Kupower(s) will be displayed in the chat window. A twofold treat awaits the astute adventurers who discover the tablets! Players will receive Kupofried's Ring—a precious relic left behind by the legendary king himself that is said to possess prodigious powers—as well as an additional reward corresponding to the particular tablet they reclaimed. A Special 7th Vana'versary Bonus! Under normal circumstances, recovering the complete set of Mog Tablets will trigger three randomly selected Super Kupowers. However, should the set be restored during "Adventurer Appreciation Week"—Tuesday, May 12 at 1:00 a.m. (PDT) to Monday, May 25 at the same hour—all eleven powers will be released simultaneously! Just think of it as one small expression of gratitude to all of you who have helped to make Vana'diel the rousing realm of adventure that it is! Post subject: Re: Go All to Piecesâ€”The Mog Tablet Quest Unearthed! Aside from the signet bonuses being permanent (but random each week), It looks like only 11 people per week, per server, will be able to pick up the Kupofried's Ring. If you can get this ring multiple times provided you drop the previous beforehand, I can guarantee some sort of third party tool will be developed to track the tablets down every conquest tally, and we'll have a group monopolizing them on every server. Honestly, sometimes I wonder if SE is run by a group of retarded chimps who enjoy banging their heads against the wall until they're in such a state that they can come up with such incredibly idiotic stuff like this. I'd really like to know how in their wildest dreams they ever saw this working in a way that would not infuriate 98% of the server that will have nearly 0 chance at this ring. Kind of doesn't make sense.....More than likely they'll be reset at conquest update, so JPs and people more west in NA wont really get a good shot at finding a tablet (they'll probably all be found in a matter of hours max). EUs will be primed for them though lol. But I guess wait and see, if you can only get 1 of the rings per year (lets say) that'd prevent monopolization to an extent. I agree, I honestly hope they set some sort of a time limit to obtaining these rings. It's the only way. They have to know that if they're re-obtainable each week that people will find a way to cheat or exploit third party tools in order to monopolize it. The other big piss-off for me was that it'll be reset at the conquest tally, which I think works out to 10 or 11am est? I know for certain it resets Monday at 00:00 JST, maybe Astrai can offer some help in determining what that works out to be in other time zones. Hopefully they'll just randomly pop throughout the week so that "camping" them is really wont be an option. Stumbling across them will be the only way to find them. That and making the rings not reobtainable will make this event work imo. I just heard an intersting tidbit of information, presumably from a dat miner. 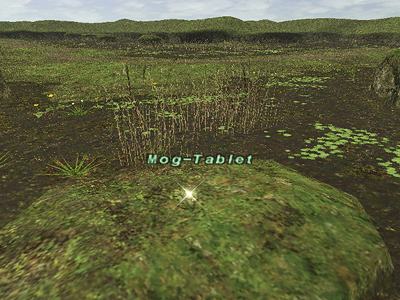 It appears that the "Mog-Tablet"s wont appear as a targetable option unless you're in the general vicinity of them. Thats at least avoids use of Draw Distance to gain an unfair advantage. Though people are thinking that ApRadar will still be able to be used as an explot for this however.